Let's see some cute guinea pig pictures. 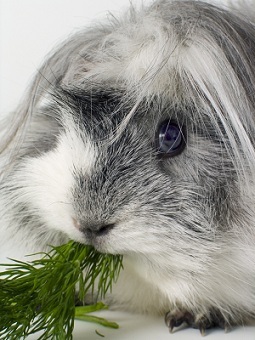 Oh, just before you scroll down to see some of the photos, let me ask you -- would you like to see YOUR little cavy here? Well, if the answer is yes, contact me and I will add your pet's photo to this page! 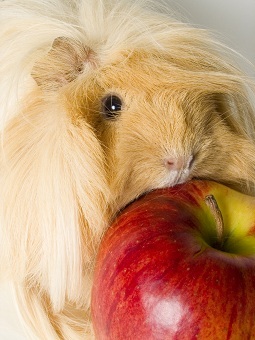 Look at guinea pig pics and have fun! 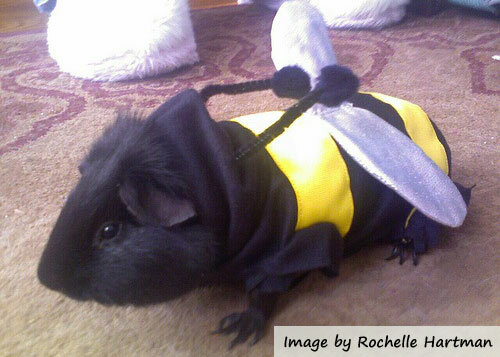 You can find or make great costumes for these little pets. What about YOUR pictures and stories? 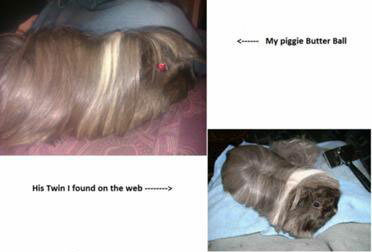 I really want to see your pet piggy and it would be great if you want to show them. Below are some of the stories and photos submitted by readers, just like you, that you can vote and comment on. And if you scroll more down the page, you can see even more photos and stories about these great pets. Hello! I am Rodrigo. No cameras, please. Brankica: Lol, did he just run away from you and the camera... So funny! Puppy Paws and Butter Balls decided they wanted to go on a bike ride :D :D :D.
I have 8 piggies currently- super cute! Brankica: They sure are, I can't even pick a favorite, they are gorgeous! My guinea pig is called Pumpkin. She's a self buff and her DOB is 15/09/07. Her sister, Lellafilla, is my little sister's guinea pig. Lella is a self buff too and she was born on the 6th of September, 2007. Our guinea pigs love being together and they both have very different personalities. Pumpkin is nervous and jumps whereas Lella is fat, lazy and soppy!! They both L O V E curly kale and green beans. No non-blurred photos, sorry! 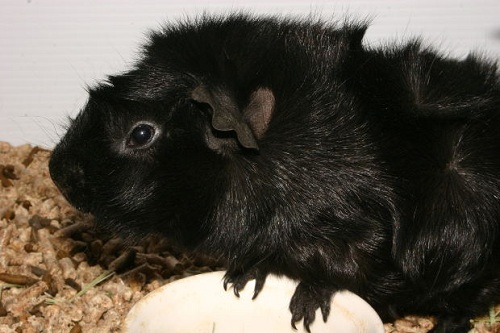 Was looking up pictures of long haired guinea pigs for my son and came across one who looks like a double for our Butter Ball. I currently have 3 guinea pigs, 2 males & a female (don't worry the female has her own cage away from the boys & across the house). My 2 boys are brothers. Hi my name is Clara. I would like to talk about my guinea pig, Twitchy. She does a cute "dance" if she gets an "unusual" feeling in her fur. She JUMPS up in the air and accidentally bumps her back on the ramps in her cage (ugh, how much pain THAT must be). Beside these pics you can send different stuff like parakeet photos, pet odor removal tips, movie review of your favorite pet movie, list a pet adoption center or get a FREE pet advice. Or you can see what others have sent us on those pages.